CPO (cost-per-open) is the amount of money the advertiser is willing to pay per email opened. Bear in mind that Emailbidding only counts Unique Opens for performance measurements and billing. The CPO also influences your campaign Factor that will be responsible for your campaign performance. An Unique Open means any number of opens of a campaign email, by a single subscriber, made within one hour counted from the first open, which means that if several opens of one single e-mail happen within one hour since the first open occurred, only one unique open will be considered. Emailbidding uses only unique opens for its performance measurements. We do this because we believe this is the only fair way to present good quality results to our advertisers. The plain text is used to show your campaign offer on devices that don’t read html. Emailbidding always advise to write the sender’s name (campaign brand), a brief offer description and a link – this way, subscribers only reading plain text can also reach your landing page. Use this correctly and you will never lose a lead again! When changes are performed in a campaign, you need to save and submit it. The status “incomplete” occurs when a campaign has changed and these changes have been saved but not submitted again. To prevent this from happening, always click on the submit button. Having in mind that all the campaigns submitted are manually verified according to our policy requests, the campaigns are usually evaluated within a few hours after the submission. However, it can take a bit longer due to periods of big affluence – for this reason we give a maximum 24 hours period to evaluate a campaign. Note that all the campaigns are sent on the day following the approval, for this reason, we recommend that our advertisers submit all the campaigns in advance. Do you want to try a new email kit? Or maybe just change the subject? That’s easy: enter your campaign, go to the “Email Design” menu and click the “+” button. You can read all the details on this article! Emailbidding is not an Affiliation Network because we segment the audience that will receive the message in a way that an Affiliation Network doesn’t. In this type of network the main goal is to spread the word about a product/service everywhere and to everyone (with banner ads for example). With us, the recipients will only receive information that is useful and interesting for them. We deeply respect the subscriber. We can’t accept that as many email providers block this feature. Emailbidding default templates for email marketing campaigns are responsive and tested on several email providers and devices in order to save you time on building your new awesome email kit! The category list presents a wide variety of themes that will fit almost every campaign. You should choose the one that matches your campaign theme and not the target audience you would like to have. Each campaign only has one main category, so don’t duplicate your campaign in order to choose more categories – it will be rejected. For a campaign promoting young men’s clothes, you should choose the category “Apparel” and not “Games & Consoles”. The category represents what your campaign is all about and not who you want to target. If you want to target young adults, select the age range on the next menu. After activating this feature, you need to copy the link provided and install it on your campaign’s landing page, according to the place where your conversion happens. The Suppression List feature can be used in order to define a set of email addresses you don’t want to send this campaign to, such as your existing customers. If your suppression list has no more than 200.000 email addresses, you can upload it directly on the platform while setting up the campaign, under menu “Options”. Once the campaign is submitted, the file will be automatically processed into the database to be excluded by algorithm. Step 1: Go to menu “Options”. Step 2: Drop your file or click to browse. The file must be in .csv, .xls or .txt format. It must have one email address per line. The email addresses can be encrypted with “MD5“. 2. On Emailbidding’s SFTP, you will have an exclusive cloud space available where you can put your suppression lists. An operator then will manually pick up the file and process it into the database to be excluded by algorithm once the campaign starts. Step 1: Request a username and password by sending an email to support@emailbidding.com or by contacting your Emailbidding Account Manager. You should indicate the campaign name. 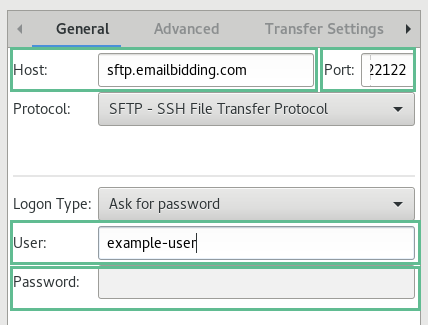 Step 2: Fill the following fields: Host: sftp.emailbidding.com, Port: 22122, User and Password. Emailbidding allows you to run campaigns on our Publishers’ newsletters. After you have defined your campaign name, start and ending dates, category, bid and budget, you can start setting up your banners by pasting your image URLs. Don’t forget to write each URL in a different line. Our system will validate the images automatically and sort them by type. We are not an ESP simply because our platform doesn’t focus on quantity, but rather on quality. Our main goal is to maximize results, both on clicks and opens, not the number of emails sent. We reach the audience you want! You need to check when was the last time you’ve logged in in our platform! As explained in our Terms and Conditions, an account is automatically canceled if the user doesn’t use its account for at least one year, without prejudice of other contractual, legal or tax obligations that, by its nature, should survive termination, such as any pending or due payment. If this is not your case, please contact our support center and we’ll guide you through the process. Just click on the “Contact” option on the top or bottom of the page. An Unique Click means any number of clicks on any Link inside a campaign email, by a single subscriber, made within one hour counted from the first click, which means that if several clicks happen in one single e-mail within one hour since the first click occurred, only one unique click will be considered. Emailbidding uses only unique clicks for its performance measurements. We do this because we believe this is the only fair way to present good quality results to our advertisers. CPC (cost-per-click) is the amount of money the advertiser is willing to pay per click. Bear in mind that Emailbidding only counts Unique Clicks for performance measurements and billing. The CPC also influences your campaign Factor that will be responsible for your campaign performance. On Emailbidding, Advertisers define how much they are willing to pay for each click, but Publishers can also define a minimum or maximum CPC for their database(s). The Billable Unique Click is the campaign’s first click (the unique click) made by the subscriber. Even if a subscriber clicks several times on the email, for the next 60 minutes only one click will be billed. Since opens and clicks can be performed several days after the email has been sent, Emailbidding counts all the unique clicks made in the next 30 days after the email has been sent. Click-through rate (CTR) ou Click-through Open rate is the percentage of clicks registered over the number of opens on a specified period (per campaign). The CPM (Cost-per-Mille or Cost-per-Thousand) is the cost of a thousand emails sent. CPM is a commonly used unit in advertising. It is used in marketing as a benchmarking metric in order to calculate the relative cost of an advertising campaign or an ad message in a given medium. The budget is the amount of money that you allocate to your campaign. In the estimated perfomance, you can see the estimated results based on the budget that you decided to allocate to a particular campaign. Bear in mind that the campaign performance can be limited by its budget. For that reason, you can also set the budget as unlimited. In Emailbidding platform, you can set your campaign budget as unlimited. If you do so, you won’t be limiting your campaign perfomance with a certain amount, letting it reach the maximum volume possible of clicks and opens. You can always see the estimated total spending in Estimated Perfomance at the menu Targeting and Bidding. The Factor is a proprietary algorithm implemented by Emailbidding based on your campaign’s opens, clicks, rate of unsubscribes, spam complaints and bid, collected throughout the different stages of your campaign. The factor is calculated by comparing your campaign with others that are competing for the same segments. The campaign rank position (determined by the factor) defines the sending priority in each segment. Our algorithm promotes the success of all campaigns, always trying to send your message for the subscribers that are more likely to be interested in it. Publishers have databases with different quality levels and they might require a minimum CPC for each of them. Your campaign might be influenced if its CPC doesn’t reach these undisclosed values, since the most premium lists are likely to have a higher payout. Another scenario occurs when two or more campaigns, that are competing for the same subscribers, have similar performances – as a marketplace, the one with the highest bid will get more volume of emails sent. Click in the yellow exclamation mark button to check if there are any errors. If your campaign contains any external domains, a message will show up on the top right corner of your screen, showing a short explanation on what external domains are present in your campaign – they can be in the “Design content”, “Plain Text Content” or in the HTML Source. After the errors are shown, search for them inside the corresponding area (“Design content”, “Plain Text Content” or in the HTML Source). After you find the detected errors, just remove or change them. Bear in mind that when the external domain is detected in the HTML, many times they are inside fields such as “title=” and they will have to be removed. Bear in mind that a correctly inserted domain is inside “href=” or “src=” fields. All the other fields can’t contain external domains. After you have performed the changes, please repeat Step 1 to check if there are any other errors. Do not forget to save and submit your campaign. The Pre-Header is a small phrase that usually appears on your incoming email list, right next to the subject (e.g. : Gmail, Hotmail, Yahoo). When not defined, the Pre-Header assumes the first words contained in the email message. With this feature, you will be able to use the pre-header as a strategic complement to help boosting your campaigns’ openings. Ideally, this text should be a striking phrase, something to induce the subscriber to open the message! If your campaign has the status “Not Ready” and you have already made all the changes you wanted to your campaign, you just need to click the submission button (arrow) to submit it. If the button isn’t clickable it means you need to save the campaign first. After that, the submission button will be enabled. The Warming-Up stage is the first stage of your campaign. Your campaign is active and running but limited to a certain volume of emails during the first 2 to 3 days (the days and volume depends on the country where the campaign is running). 1. The first one is to assure to the Advertiser that if the campaign has any problem, there is a 2 to 3-days period to correct it without a large volume already been sent. 2. The second reason is to test the subscribers’ behaviour, sending it to selected subscribers and allowing the algorithm to make an accurate selection of the micro-segments that are more interested in your message. This assures that when the campaign is running full speed, the emails sent will be focused only on the segments of subscribers that have shown more interest, allowing it to increase click rate, open rate and also conversions. Thus, the warm-up period will maximize the campaign’s performance and give you a higher delivery quality. Tip: Check the Detailed Statistics to see the the open and click rates by gender, location and age. This can help you to achieve a more accurate segmentation and a better understanding of the audience interested in your campaign. A suppression list is a list of email addresses that the Advertiser doesn’t want to send his campaign to. 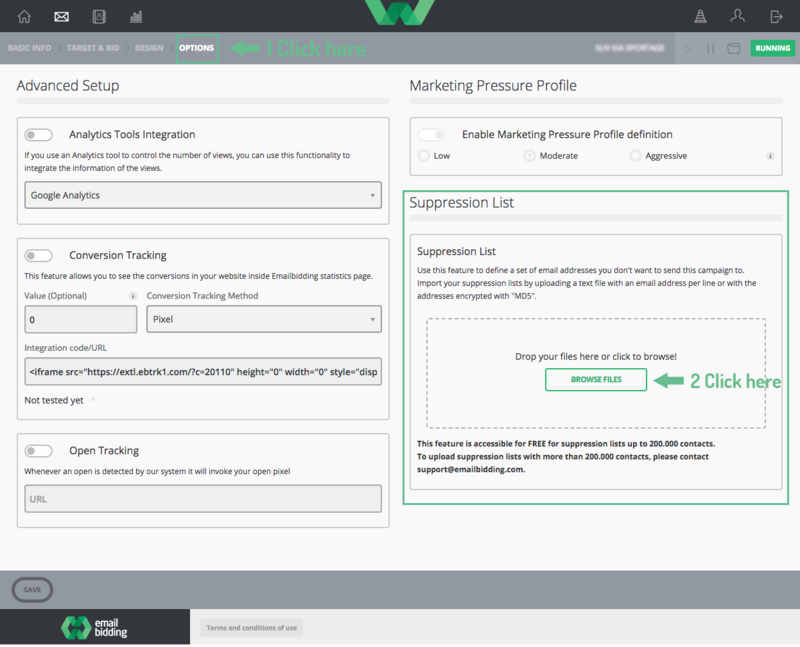 To add a suppression list to your campaign you can upload it in the Advanced Setup menu. Note that all the suppression lists need to be upload by campaign and not by Advertiser even if the campaign is duplicated. To recover a campaign that you have already archived, click on the duplicate button, choose a name to the new campaign and then click on “Duplicate Campaign”. Note that this action will duplicate your campaign by creating a copy of the email kit but not suppression lists. The new campaign will be added as “draft” to your campaign’s list. To have a full view of your campaign statistics you can either select to see the information organized by send date or event date. So you can choose to see what is more important to you! Statistics saves all the campaign’s information that is useful to analyze the its performance and daily cost. When Send Date is selected, the events are shown according to the day in which the email has been sent, no matter if they happened on a different day or not. This option is very useful to monitor the campaign performance according to the date the emails have been sent. When Event Date is selected, the events are shown according to the day they have occurred. This option is very useful to monitor the costs of your campaign. Tip: We recommend you to use the options on the left to select the different filters you want to apply (like filter per day, campaign or country). It has a high level of unsubscribes – Emailbidding worries about all the participants in the marketplace, this way even if a campaign has a good performance, a high level of unsubscribes will be harmful to the Publishers’ database(s). If this happens, the competitiveness Factor will decrease and the campaign will lose volume (or in worst cases even stop completely) – solution: change the segmentation and rethink the target audience. Has been running for a long time – if a campaign is running for a long period of time with the same promotion, email kit and subject, then it will likely see a decrease of performance since the subscribers may be unhappy for receiving it continuously – solution: rethink the campaign’s duration strategy and change the email kit and subject in a more regular basis. This situation is described in our Terms and Conditions, where the due payment of all the Unique Clicks generated within 30 days after the campaign finished, shall be invoiced by the Data Processor to the Data User. So even if a campaign is scheduled for just 2 days (for example), the clicks are tracked and billed on the next 30 days after the email was sent. When analyzing campaign statistics by event date, the number of delivered emails on a certain day may be negative. This happens because emails sent in previous days that were not correctly delivered by the e-mail servers are shown on this field as negative send-outs. When analyzing campaign statistics by send date, the non-delivered send-outs are shown directly on the day that the email was sent and thus the number of delivered emails is never negative. Emailbidding cannot approve a campaign when a domain that is used on that campaign is on a blacklist. If this is happening, please access that specific blacklist’s policy and follow the necessary steps so that your domain may leave that blacklist and the campaign may be approved.